Facebook | Tableau Your Data! The goal of the Business Information (BI) team at Facebook is to enable a cycle of analysis that allow team members to take advantage of this data. Figure 1 illustrates the cycle of analysis at Facebook. Stephen Few explains this process well. Controlling the promotion of user-created dashboards while ensuring the quality of the information is of primary concern. Since Tableau lacks a semantic layer, each user can define key metrics however they see fit. This can lead to incorrect or contradictory reports. 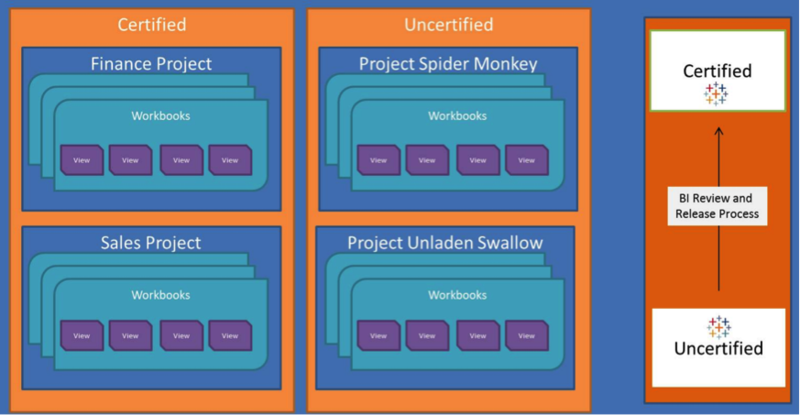 The project taxonomy that has been adopted at Facebook is a two-tiered promotion model (certified and uncertified reports) that share the same physical hardware. The uncertified area serves as a safe sandbox for end users. Objects will be promoted to the certified area only after they are reviewed by a member of the BI team. Comprehensive reviews cover the data model, workbook and dashboard performance and visualization standards/best practices. Figure 2 shows the project taxonomy. This taxonomy and architectural structure have allowed Facebook to scale resources and successfully meet user demand as their user base grows. As the world’s largest social network, Facebook is focused on people, their interactions, building relationships and making the world more open and connected. This mission also applies internally to everything they do at Facebook, including deploying new technologies. In order to make Tableau a success, Facebook hires the best and brightest talent in the world. By contracting with an experienced consulting partner and also hiring full-time staff that are dedicated to getting Tableau physically installed, architected properly and providing initial training, Facebook is able to support hundreds of new desktop users effectively and achieve high return on investment. Figure 3 shows the team structure. Like most organizations, BI at Facebook was initially very centralized, with a few people processing all of the reporting and analytical requests for the entire organization. 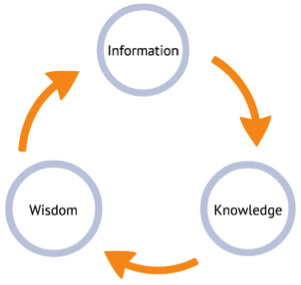 This is not an efficient operating model if you truly want to gain insights from your data. Everyone at Facebook is expected to tackle the biggest problems. In order for that to happen, Facebook needed a comprehensive and holistic program that would eliminate the roadblock of the BI team and provide a platform that enables everyone in the company to be an analyst. 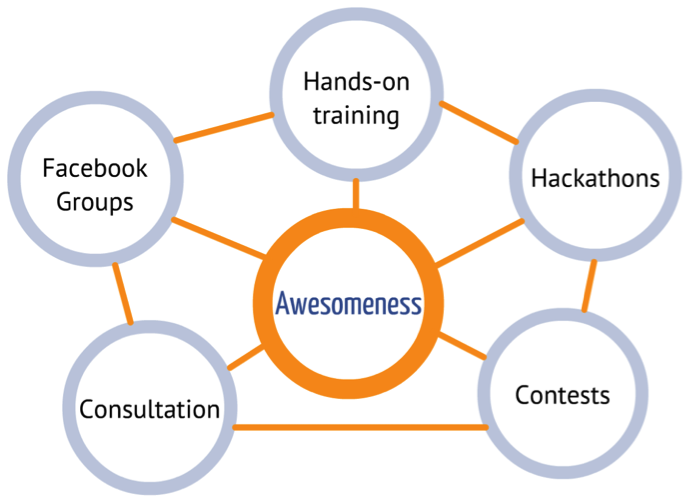 Figure 4 shows Facebook’s comprehensive platform for success. Tableau is an incredibly intuitive tool, but Facebook wants to provide a richer experience aimed toward creating the most sophisticated user base in the world. To do this, weekly training sessions are provided. At the end of a one-hour session, users are able to create dashboards like the one you see in Figure 5. Figure 6 is an example of the kind of dashboard students build in an advanced training class. 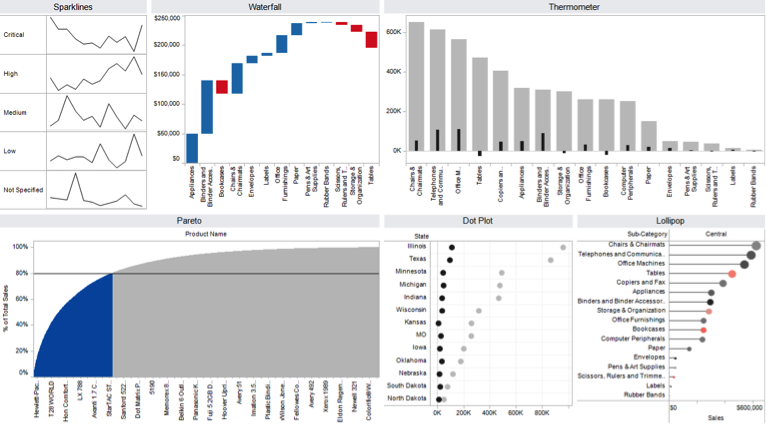 The dashboard example in Figure 12–7 incorporates a sparkline, waterfall chart, a thermometer (bar-in-bar) chart, a Pareto chart and a lollipop chart. All of these are easy to build once the techniques are understood. As Facebook is still nurturing its Tableau community, these sessions continue to be immensely helpful. Facebook has internal groups for everything they do — products, teams, new launches and even for their chefs posting the daily meals. 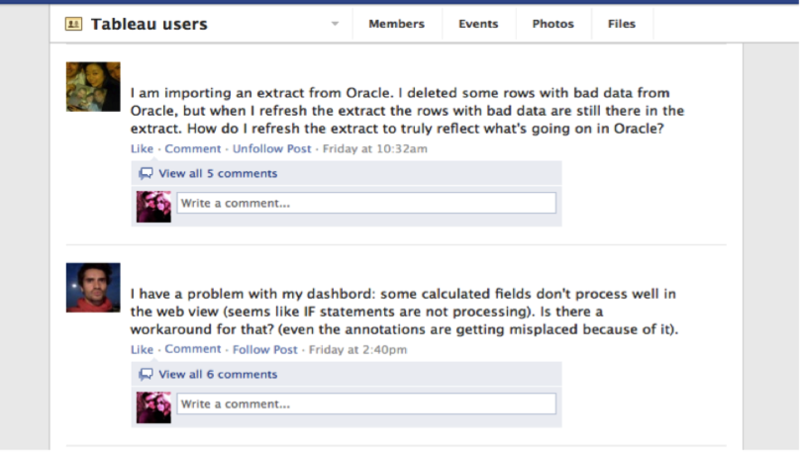 They have built a very active Tableau community on the Facebook website. On their group page, they post important updates regarding their database, servers, upgrades and other maintenance issues. This is also the forum where users post questions. Figure 7 shows typical Tableau user questions. This group reduces e-mail to core Tableau resources and provides a repository of knowledge. The entire group learns from this repository and often, people who have been trained are able to answer questions in this venue. Training is most effective when the examples and situations that are covered use Facebook data, which helps make the material stick and allows them to see how they can apply the principles immediately. In addition to their internal training, they invite industry experts to speak to trainees. Recent speakers included Andy Kirk, Alberto Cairo and Drew Linzer. Over 250 people have received training on data visualization best practices, and over 750 people have attended Tableau training sessions at Facebook. This participation has been phenomenal. 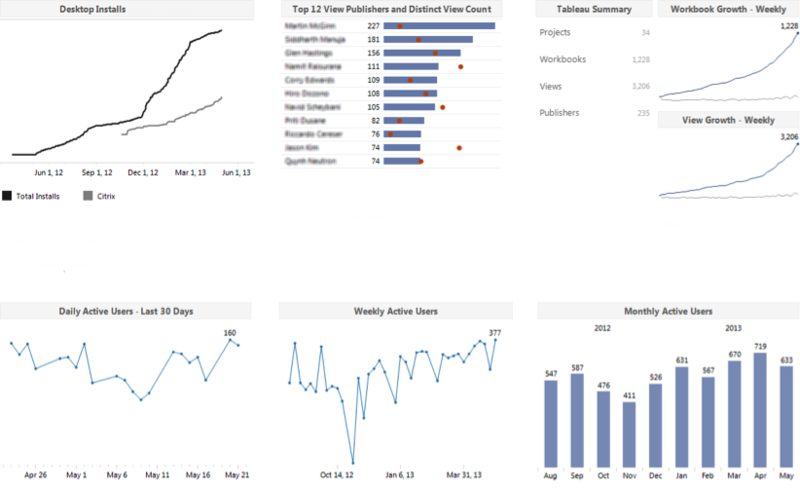 Figure 8 is a Tableau dashboard that shows the progression of Tableau at Facebook. Hire the best and brightest. Without top talent, you won’t be as successful. Find champions for your cause. Identify someone senior in the organization that believes in Tableau. 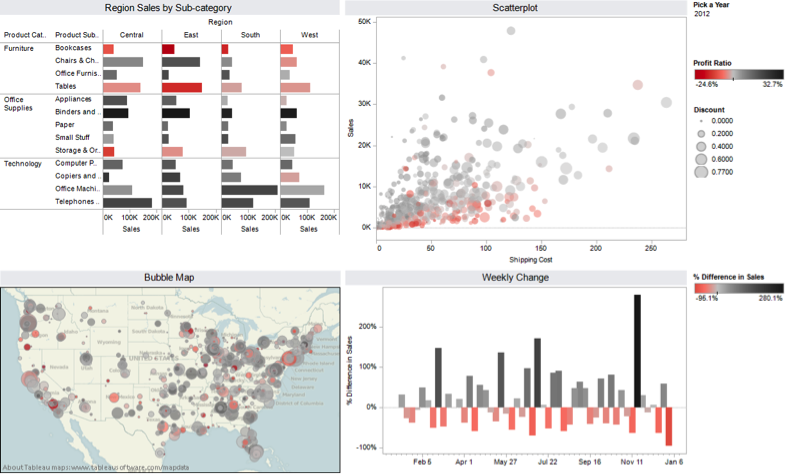 Find a project to use Tableau; share it and you’ll be on your way. 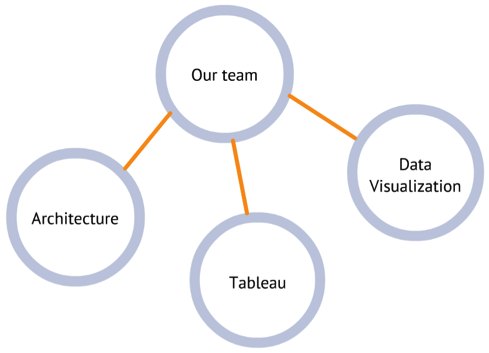 Tableau will quickly become an integral part of your organization. Be bold. Don’t be afraid to take risks. It’s important to fail. Without failing, you won’t learn. Be open with your data. At Facebook, nearly all data that is used in Tableau is available for consumption by anyone in the organization, with the exception of data about users, HR data and some revenue data. Facebook Business Information Team leaders expect the growth of Tableau to continue on its current trajectory. They have long-range plans to support this growth, from both architectural and training perspectives, and Facebook will continue to build a more self-sufficient community of users.